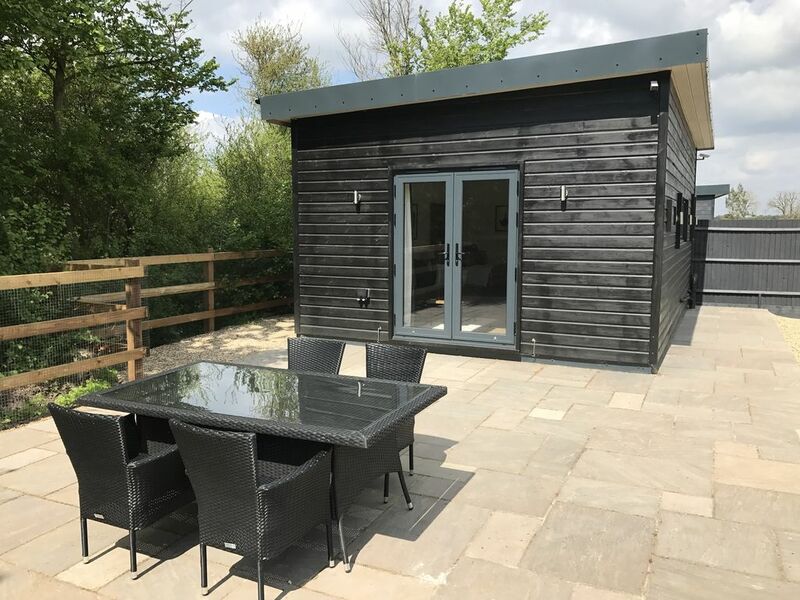 Revel in the joys of a country lifestyle (just 2.6 miles from Windsor Castle) by staying in the Cowboys and Angels luxury holiday cabin at Willow Court Farm in Windsor. On summer evenings take a 5-minute walk to the award winning pub The Greene Oak. Willow Court Farm is located in Windsor in the County of Berkshire. Its 1.4 miles from Legoland, 2.6 miles from Windsor Castle and 9.3 miles from London Heathrow Airport. We are also 9.7 miles from Pinewood Studios and 9.3 miles from the beautiful Virginia Water and Royal Windsor Saville Gardens. Entry to Willow Court Farm is via a private entry gate code. The Cowboys and Angels cabin is the most private cabin on the farm and is tucked away at the far end of the property. It was fully renovated in March 2017 and is an open-plan studio style cabin. The cabin has a very large, private and fenced garden suitable for children to play and roam safely. There is also ample private parking close to the cabin entrance for added convenience. As the cabin is the furthest out on the property, there are no cars passing which adds to the serenity as well as contributes to the unobstructed views of the black night-time sky and star gazing. There are also a variety of farm animals on the farm including pigs, sheep and chickens and you are welcome to collect your own eggs in the morning for breakfast. The garden includes a large lawn as well as a paved patio area which is perfect for firing up the gas BBQ. The cabin has been lovingly furnished with attention to detail. It’s bright and airy with high ceilings, is approx. 30 square meters in size and has double patio doors opening onto the garden and a breakfast bar area for inside dining. There is both a double bed and pull-out (very comfortable) double sofa bed and custom made built-in wardrobes with plenty of hanging and storage space together will all the essentials needed including ironing facilities. There is high-speed WI-FI throughout and a 40-inch Samsung flat-screen Smart TV. The kitchen is small and yet well-equipped including electric hob, oven, microwave, fridge, dishwasher and coffee machine. The separate bathroom includes a large walk-in shower, vanity basin and WC/toilet and is equipped with a hair dryer and complimentary toiletries. Please note there is not a washing machine/dryer in the cabin, however there is a very good launderette 3 minutes drive away (opposite Tesco supermarket). Please Note: We can only accept 2 adults and 2 children and are unable to accept bookings for 4 adults. Enjoys a rural location even though only 10 mins to Windsor and surrounds by car.